Many of us were shocked by the news reports a few weeks ago describing the hundreds of love letters and other fan mail that were being sent to the shooter who was responsible for the massacre in a Florida High School in the USA. Most of these letters were written by people who knew nothing about him other than what he looked like and how he had gone about killing and wounding dozens of his former school mates with a high powered assault rifle. But that was enough for hundreds of people to become infatuated with him and to send him letters professing their love or admiration or support. There were a few religious ones, urging him to repent and accept God’s forgiveness and promising to pray for him, and those are the only ones that the prison authorities allowed him to see. But the majority were simply love letters and fan mail. It seems grotesque and shocking, but is it really that much of a surprise? Do we not live in a culture that is enthralled by killers and killing? How many of the movies we watch for entertainment contain more killings than we can count by the end? And in many cases, is it not true that the body count inflicted by the goodies is at least as high as that inflicted by the baddies? And is it not also true that in many cases, the ability to efficiently kill those deemed to be baddies is the primary attribute of the heroes? And even when we are reeling in shock over mass killings like the recent ones in Florida and Las Vegas, are the obsessions that mutate into infatuations really all that different from the obsessions that see many of us poring over the news reports for hours, trying to take in as much detail about the killer as we can possibly find? I suspect that at the root of our enthralment with killers lies a belief that killing equals power. The power to end the life of others seems like an ultimate power, and we have always tended to see the ultimate power as something that is somehow godlike or sacred, something that belongs to God. Taking lives in the name of our gods has been at the heart of most religions, whether it be the killing of sacrificial victims offered to a god, or the killing of our god’s enemies in war or in capital punishment. In nearly every society on earth, the highest authorities, whether they be kings or dictators or elected presidents and parliaments, have had as their ultimate power over their subjects the right and the capacity to kill them, and usually that authority is understood as being given to them by God. Our nation might have ended its practice of capital punishment, but it would only take an act of parliament, not a referendum, to reintroduce it. And our parliaments can and still do arm our police and our military with lethal weapons and authorise them to use those weapons to kill people. Whether you think that is right or wrong, there is no doubt that we regard it as the ultimate expression of power in our society. We simply want the “good guys” to have more of that power than the “bad guys”. It has often been said that power is the ultimate aphrodisiac, and if that’s true and we equate killing with power, then it should be no surprise that we become enthralled and obsessed and even infatuated and aroused by high profile killers. Now I want to suggest that one of the main reasons that our fascination with killing as the ultimate power is serving us so badly, and instead of keeping us safe is making our society a more dysfunctional, dangerous and frightening place, is that two of the things I have said that we believe about killing are actually completely wrong. We are completely wrong that the power to destroy life is the ultimate power – the power to create and re-create and maximise life is actually the ultimate power. And we are completely wrong that the power to destroy life is something that belongs to God and which is exercised by God. The God made known to us in Jesus has no interest in and no involvement in the destruction of life, in killing. God is all about creating and re-creating and maximising life. We heard this message coming through in our scripture readings tonight. Our first reading was one of five public sermons preached by the Apostle Peter recorded in the Acts of the Apostles. In all five of them, the most consistent theme is his assertion that it is we humans who kill, and God who creates life, even out of death. In tonight’s example, we heard him say, “You rejected the Holy and Righteous One and asked to have a murderer given to you.” Maybe today he would have said “You rejected the Holy One and sent fan mail to a murderer.” And then he goes on to make it even clearer: “You killed the Author of life, but God then raised him from the dead.” You killed, but God raised the dead to life. If you read through all five of Peter’s sermons, you will see the same theme recurring. Killing is a human activity. God’s only involvement in killing is to suffer it as the victim. It is giving life that is what God is all about. Creating life. Restoring life. Maximising life. 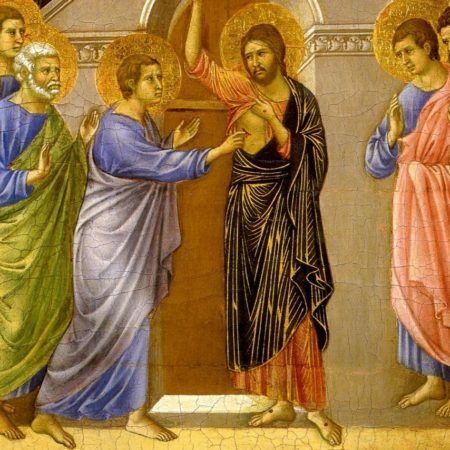 In our reading from the Gospel according to Luke, we encountered the risen victim himself, the Righteous One who suffered death at our hands, but who God has raised to life. It is no wonder the disciples’ heads were spinning. Jesus is at pains to make it clear to them that he’s not a ghost, but he doesn’t pretend that he hasn’t been killed, that he’s not dead. He shows them that he is still fatally wounded. It is perfectly clear that he has died, but here he is, talking with us and shaking hands with us as though being dead is of no consequence at all. But we can make no sense of this on the basis of anything we’ve ever known or experienced. Clearly he’s not a ghost, for although he does some things that ghosts are reputed to do, he carefully demonstrates that he has a physical substance and solidity that no ghost has. I don’t know whether the category of zombies had even been thought of in those days, but clearly he’s not a zombie either. He is a dead man walking, but in absolute contrast to zombies, his present existence is not in any way defined or dominated by death. Zombies are all about death, but to Jesus, death seems to be an utter irrelevance. Jesus is, like God, entirely about life. Being dead, which we always thought was so final, seems to have no power over him at all, no power to define him or restrain him or terrify him or fascinate him. It is the illusion of finality that deceives us into thinking that the power to kill is the ultimate power. The raising of the crucified Jesus has shown that to be a lie. Death is shown to be a pretender. It does not have the final word after all. God has the last word, and God’s word is Life. Life and love and abundant mercy. Life that death cannot hold. Life in all its fullness. Life bursting free where death claimed to reign. Life bubbling over and freely available for all to share. Surely what that means is that he needs to open our minds to understand the scriptures from the perspective of a worldview dominated by life rather than death. I know lots of people who still read the Bible as though it were a manual for how to avoid the consequences of death. I used to be involved in trying to evangelise people by playing on their fear of death and of the finality of death. The Bible as I understood it warned us about God’s willingness to cast us into the hell of second death, and showed us how to get ourselves released from that otherwise inevitable fate. But somehow I was still reading and preaching the Bible as though death and the fear of death’s finality was the defining theme, and was indeed something that God was involved in dealing out. I was utterly wrong, and I needed the risen Jesus to open my mind to understand the scriptures anew, as a witness to the God who is all about life and life in all its fulness. When we begin to read the Bible from the perspective of life, we begin to see that those things we were previously reading about death are not the dominant theme at all, but are actually a disappearing relic of an old view of God that is being swept away in the unstoppable tide of God’s passion for life and love and reconciliation. In our second reading, we hear the Apostle John tell us that Jesus “was revealed to take away sins, and in him there is no sin.” But John goes further and says, “No one who abides in him sins; no one who sins has either seen him or known him.” Which read from the old perspective of a Bible warning of death would have been enough to scare us all witless, because as we confess here week by week, we all live entangled in sin, and there are times when it trips us up. But John knows that, because has already told us last Sunday that anyone who claims to be without sin is a liar and that when we do sin, Jesus will advocate on our behalf. So what can he mean when he now says that “no one who abides in him sins”? I think it is this same thing I have been talking about. Which worldview are we immersed in, abiding in, and allowing to shape us? He’s not saying that if you sometimes stumble into some sin, that you do not belong to Christ. Rather he is saying that if your life is all about sin, and is defined and shaped and dominated by sin, then you can’t be abiding in Christ. If your life is shaped by a culture that is fascinated by killers and killing, then you will probably have trouble seeing and following a pathway of life. This is not a judgemental statement; just a statement of the obvious. It is a bit like saying that if you are completely dry, then you are not swimming, you are not abiding in the water! In fact, he is probably implying that if you are really living your life immersed in Christ, you probably won’t need to worry about sin at all because it will simply be happening less and less. It is no more possible to live your life immersed in the exuberant abundant life of Christ and stay sinful than it is to swim naked and stay dry. Perhaps that’s why Peter’s sermon doesn’t just say “Repent and have your sins forgiven” or “Repent and have the penalty for your sins cancelled.” He actually says “Repent and turn to God so that our sins may be wiped out.” Wiped out. Eliminated. As powerless and irrelevant to Jesus as death itself. When life in all its fullness rises triumphant and is all that matters, both sin and death are shown to be powerless realities that need no longer have any say over our lives at all. In a moment we will come to this table, to share the celebratory feast of our risen Lord. I’ve been in churches where the table seemed to be observed only as a solemn reminder of our Lord’s death. That’s not entirely wrong, but it is the starting point, not the whole story. This is the table where our risen Lord bids us celebrate with him, remembering his execution, not out of a fascination with death, but primarily so that we can see how thoroughly the power to kill has been overthrown by the power to raise life out of death and how comprehensively the love of power, lethal power, has been swallowed up by the power of love. So come, let us sing and celebrate and feast on the life that has broken the power of sin and hatred and death and risen from the grave to make all things new.